Another week has come and gone and that means another week full of options activity to report on. Since I've been working days, which means being able to follow the markets intraday, I've been very active with options as an income source. Last week was another week of 30+ total moves so that means I'll be splitting the recap in two once again. Today I'll cover the 21 new or rolled positions and later this week I'll cover the closed ones. The great thing about using options on top of existing positions is that you can constantly reduce your cost basis. That's the premise of the covered call; by capping the upside potential of the investment you can reduce your cost basis by the amount of the premium you received. Thus far I've been able to reduce my cost basis on my V.F. Corporation shares by $4.25 per share since January while still owning the same 100 shares the entire time. I was tempted to make this a covered strangle instead of just a covered call, but wanted to keep some capital free for some upcoming earnings plays as well as any other potential opportunities. If V.F. Corporation's share price is above $57.50 at expiration then I'll have to sell my shares at an effective sale price of $57.95. That's just fine by me if that happens because that would be a solid 17% return. If V.F. Corporation's share price is below $57.50 at expiration then I'll get to keep my shares and the option premium would be profit. 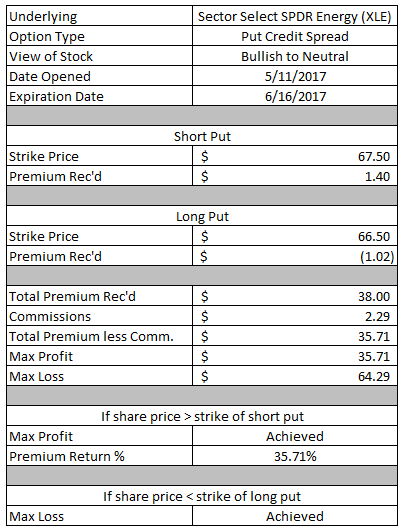 The $44.95 in option premium would be a 0.78% return based on the $57.50 strike price which would be a decent 8% annualized return. My cost basis on these shares would then effectively be reduced to $48.80. Union Pacific is a company that I've had my eye on for quite some time, but can't ever seem to find it trading at a valuation that I'd like. Well, at least not whenever I happen to have capital available. I could just move on to other opportunities or I could use options in order to get a better purchase price. If Union Pacific's share price is below $105 at expiration then I'll have to purchase 100 shares at en effective purchase price of $103.82 or approximately 5.1% lower than the current share price. The YOC at that cost basis would be a decent 2.33% with a decent valuation of 20.5x 2016's earnings and 18.1x 2017's estimates. 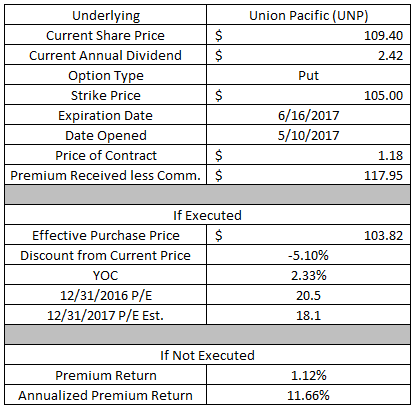 If Union Pacific's share price is above $105 at expiration then I'll get to keep the full option premium received as profit. The $117.95 would be a decent 1.12% return on the $10,500 in capital securing the contract which would equate to an 11.7% annualized return. After successfully closing out my first put option on Micron for a solid gain I decided to sell another one back out on the market. However, I went a bit more aggressive this time with the hopes of securing more option premium at the risk of having to purchase shares at a bit higher price. If Micron's share price is below $28 at expiration then I'll have to purchase 100 shares for $27.36 per share. 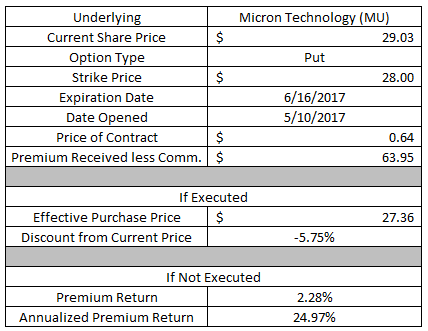 This put option offers a potential purchase of shares at a 5.8% discount to the price Micron was trading at position open. 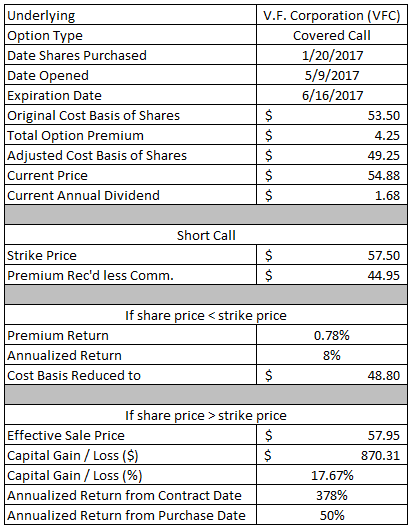 If Micron's share price is above $28 at expiration then the contract would be OTM and I would get to keep the full option premium as profit. The $63.95 in option premium would represent a solid 2.28% return on the $2,800 in capital securing the contract. If held through expiration that would equate to a 25.0% annualized return. My goal is to close this position early for a profit with a profit target of 50% of the credit received. I'm bullish on gold for the foreseeable future with gold currently sitting around $1,250/oz. However, that doesn't mean I want to go load up on gold rather I'll just use options to get my bullish exposure while taking limited risks. The max profit potential on this trade is the credit received at position open, $53.71. The max potential loss on this trade is the width of the spread less the credit received or $146.29. If GLD is trading above $115 at expiration then I will realize the max profit on this trade. The $53.71 profit would be a solid 36.7% return on the $146.29 of capital at risk. If GLD is trading below $113 at expiration then I will realized the maximum loss on this trade. My goal is to close this position early and lock in 50% of the maximum profit potential. My thoughts regarding Tesla stock is that it's ridiculously overvalued at the moment. While I like Elon and love his vision for the company and for the world, the fact is there's no fundamental business reason for the shares to be trading at the current price level and eventually the valuation will come in line with business performance. However, that doesn't mean it's going to happen next week so I made a small, calculated bet that Tesla's shares will continue to move higher or at least not drop too much. The max profit potential on this trade is the $68.70 credit received. The maximum potential loss is the $2.50 width of the spread less the credit received or $181.31. If Tesla is trading above $305 at expiration then I'll be able to realize the maximum profit on this trade. The $68.70 would be a 27.5% return on the $181.31 in capital at risk on this trade. If Tesla is trading below $302.50 at expiration then I'll realize the maximum loss on this trade. My plan is to be a bit more aggressive with closing out this position since there's a bit more risk on this trade and Tesla's share price can certainly move around. As of now my target is to secure 25-30% of the maximum profit potential. Yellow fever! I have plenty of exposure to gold via my various option plays, but that's more of a product of market circumstance than anything else. I personally think that gold is trading on the lower side of what would be considered fair value so the likely move is higher of the coming months. It also doesn't hurt that gold and the various gold related investment products carry a high baseline implied volatility which means fairly rich option premiums. The maximum profit potential on this trade is the $27.71 credit received at position open. The maximum potential loss is the $1.00 width of the spread less the credit received or $72.29. If XLK is trading above $57 at expiration then I'll realize the maximum profit on this trade. The $27.71 credit received would be a 27.7% return on the $72.29 capital at risk on this trade. If XLK is trading below $56 at expiration then I'll realize the maximum loss on this trade. Since XLU was trading around $51.50 I decided to put on an iron butterfly, well, technically a very tight iron condor. The iron fly has the short call and put sharing the same strike price, whereas I went with the $51 put and $52 call since XLU was trading between the two. The maximum profit potential on this position is the $89.42 credit received at order entry. The maximum potential loss is the larger of the two spreads, in this case they're the same at $2.00, less the credit received or $110.58. 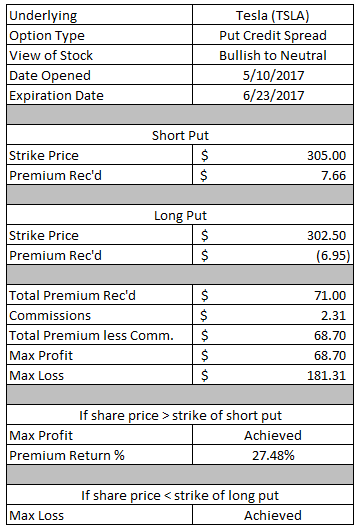 If XLU is trading between the $51 strike of the put and the $52 strike of the call then I'll realize the maximum profit on this trade. The $89.42 profit would be a 45% return on the $110.58 in capital at risk on this trade. IF XLU is trading lower than $49 or higher than $54 then I will realize the maximum potential loss of $110.58. Since the profit on iron butterfly's don't open up until close to expiration my goal is to close the position if I can lock in profits of 10-25% of the credit received. I've started to try and layer on multiple strategies around the SPY in order to get different exposures. Some bullish, some bearish, some neutral. That way there's a sweet spot where all of them can be profitable, but if one trade goes sour there's others that can remain profitable. This should help to even things out over the long run in terms of monthly profit/loss. The maximum profit on this trade is the $40.42 credit received at order entry. The maximum possible loss the largest spread width, $2.00, less the credit received or $159.58. If SPY is trading between $229 and $244 at expiration then I will realize the maximum profit on this iron condor. The $40.42 in profit would be a 25% return on the $159.58 in capital at risk on this trade. If SPY is trading lower than $227 or higher than $246 at expiration then I'll realize the maximum loss on this trade. Since the $229 and $244 levels are quite far from the current price of SPY, my target will be to close the position at 50% or more of the credit received. To many investors, myself included, the valuation of the markets as a whole are quite stretched. That doesn't necessarily foretell of a repricing in the short term; however, with earnings season for the most part over I don't really see a catalyst that would make the markets move up either. Well not significantly at least. Hence the call credit spread which is a bearish to neutral strategy that even gives you a little bit of room to the upside. The maximum profit I can make on this trade is the $30.71 credit received at order entry. The maximum possible loss is the $1.00 width of the spread less the credit received or $69.29. If DIA is trading below $211 at expiration then I will realize the maximum profit on this trade. The $30.71 profit would be a 44.3% return on the $69.29 capital at risk on this trade. *There's a typo in my formula in the above picture calculating the ROC. That's since been fixed. If DIA is trading above $212 at expiration then I will realize the maximum loss on this trade. My target will be to close the position at 50% of the credit received. The DIA is approximately 1/100th the size of the DJIA so a 1 point move in the DIA is equivalent to a 100 point move in the DJIA. Oil sold off hard a couple weeks back so this was just more of a contrarian stance on oil and the energy sector via the XLE ETF. The maximum potential profit on this trade is the $35.71 credit received at order entry. The maximum potential loss is the $1.00 width of the spread less the credit received or $64.29. If XLE is trading above $67.50 at expiration then I will realize the maximum profit on this trade. The $35.71 profit would be a 35.7% return on capital. If XLE is trading below $66.50 at expiration then I will realize the maximum loss on this trade. My target is to close the position while securing 50% of the credit received. Anyone that follows the markets has surely noticed the decidedly low amount of volatility. Heck, back in February I don't think there was even a down day for the markets. Early last week the spot VIX, the markets' "fear gauge", was trading below 10. For some perspective the long term average of the VIX is around 16-17. I wanted to stay away from volatility based products since my last foray ended up as nearly a 100% loss, but I just couldn't help myself and had to take another shot. Instead of just buying a call on the VIX I decided to go with a call debit spread on UVXY. The call debit spread is, if you couldn't guess, the opposite of a call credit spread. So it's a bullish strategy that I had to pay for in order to get into the trade. 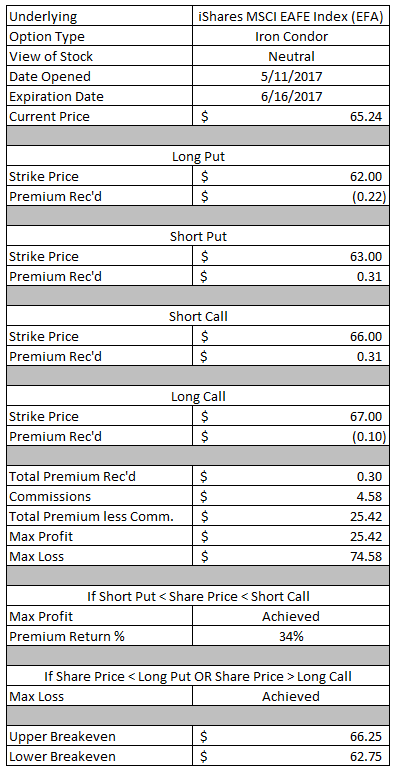 However, by selling a call with a higher strike I was able to reduce the overall cost of the trade and things set up nicely from a risk/reward perspective. The maximum possible loss on this trade is the debit paid to enter the position or $206.34. 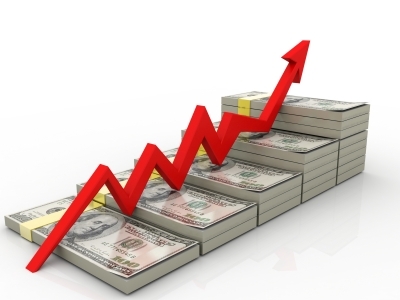 The maximum possible profit is the $8.00 width of the spread less the debit paid or $593.66. If UVXY is trading below $10 at expiration then I will realize the maximum loss on this position. If UVXY is trading above $18 then I will realize the maximum profit. The $593.66 max profit would represent a 187.7% return on the capital at risk on this trade. In order to breakeven on this trade UVXY will need to be trading above $12.06 at expiration. My target is to close this position for somewhere around $300 which would be around a 50% return on capital. Lowe's Companies is a business that I really want to add to my portfolio. The problem though is the valuation is a bit expensive, but overall I like the business because it should, at least in theory, be insulated from the push towards online retail. Plus the DIY/Home Improvement industry is essentially a duopoly with the two major players being Lowe's and Home Depot. This is technically a broken wing butterfly; however, I'm treating it as if it's a put ratio. Put ratios, at least with my broker, are a pain to do in an IRA in one trade rather you have to set it up as two. That means more commissions and it's harder to close the position out. So I went with the put BWBF with the intent being I can get a small little profit before earnings are released in about 1.5 weeks or I will own shares cheaper and can quickly turn around and sell inflated call premiums against those shares. I have to think about this trade a bit differently than a normal put BWBF so there's a few different ways this can play out. If Lowe's is above $85 at expiration then I will keep the $22.82 credit received as profit. If Lowe's is trading at $84.50 at expiration then I will realize the maximum profit on this trade of $72.82. If Lowe's is trading between $84.50 and $85 then I will realize a profit somewhere between $22.82 and $72.82. If Lowe's is trading between $83.77 and $84.50 then I will have to decide if I want to close the position or take the shares. With earnings on deck the following week I'll just take the shares. If Lowe's is trading below $83.77 then I will have to decided whether to take the shares or close the position at a loss. If Lowe's is trading below $81 then I will most likely just close the position and realize the maximum loss. The reason being that I would be showing a larger unrealized loss on the shares if I took ownership of them rather than just taking the loss on the trade and then I would look to reestablish an earnings trade on Lowe's. This is another position where I'm taking a bearish stance on the market. It's not an outright bearish play, but rather a neutral to bearish position with a slight upside buffer. The maximum profit I can make on this trade is the $43.71 credit received at position open. The maximum potential loss is the $2.00 width of the spread less the credit received or $156.29. 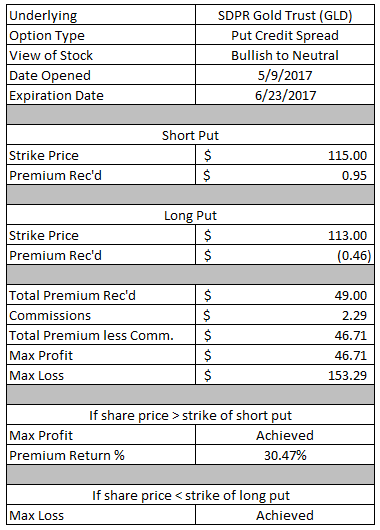 If IWM is trading below $141 at expiration then I will realize the maximum profit. The $43.71 profit would be a 21.9% return on capital. If IWM is trading above $143 at expiration then I will realize the maximum loss on the position. My target is to close the position out with profits of 50% of the credit received. Sticking with my bullish thoughts on gold I added another put credit spread on GLD to my portfolio. The maximum profit I can make on this position is the $46.71 credit received at order entry. The maximum possible loss is $153.29. At expiration if GLD is trading above $115 then I will realize the maximum profit on this trade. The $46.71 profit might not seem like much, but would in fact be a hefty 30.5% return on the capital at risk. At expiration if GLD is trading below $113 then I will realize the maximum loss on this trade. This is my first foray into trading options around EFA which is an ETF designed around Europe, Australia, Asia and the Far East. Since this is my first time that meant a small defined risk play to get my feet wet. The maximum profit I can make on this trade is the $25.42 credit received at order entry. The maximum potential loss is the largest spread width, in this case they're both $1.00, less the credit received or $74.58. If EFA is trading between $63 and $66 at expiration then I will realize the maximum profit on this position. The $25.42 credit would be a hefty 34% return on the capital at risk on this position. At expiration, if EFA is trading lower than $62 or higher than $67 then I will realize the maximum loss on this trade. My target is to close the position at 50% of the credit received at order entry. There's plenty of excellent dividend growth companies out there that I've still yet to add to my portfolio. One of those companies is a legend in the investment space, Altria. Unfortunately the valuation is still a bit rich even after coming off its recent highs up over $76. While a much better purchase price would be in the mid-$60's or lower, I don't want to wait forever for that price. Plus this put option has the added benefit that if the shares are put to me then I should receive the next dividend payment and then be able to turn around and sell aggressive ATM call options against the shares. 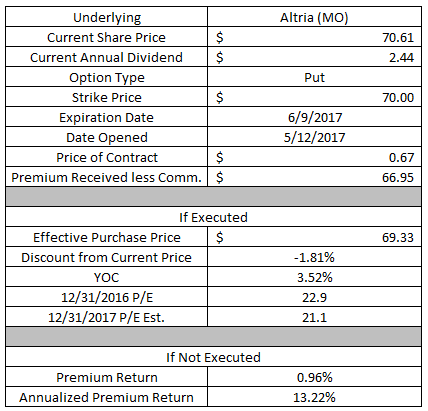 If Altria is trading below $70 at expiration then I'll have to purchase 100 shares at an adjusted cost basis of $69.33. That would be about a 1.8% discount to where Altria shares were trading at order entry with a YOC of 3.52%. The valuation would still be rich at that level with 22.9x 2016's earnings and 21.1x 2017's estimates hence my desire to then sell aggressive call options if the shares are put to me. If Altria is trading above $70 at expiration the put option would be OTM and would expire worthless. I would get to keep the full option premium as profit. The $66.95 option premium would represent a 0.96% return on the $7,000 of capital securing the contract. If held through expiration it would be equivalent o a 13.2% annualized return. While I'm bullish on gold that doesn't mean the markets are necessarily going to cooperate. This is now the second time that I've had to roll this put option in order to extend my duration and give myself more time for the trade to work out. By extending the duration of this trade by just under 1 months time I was able to pick up an additional $0.34 per share in premium which brings the total credits received on this position to $1.35. 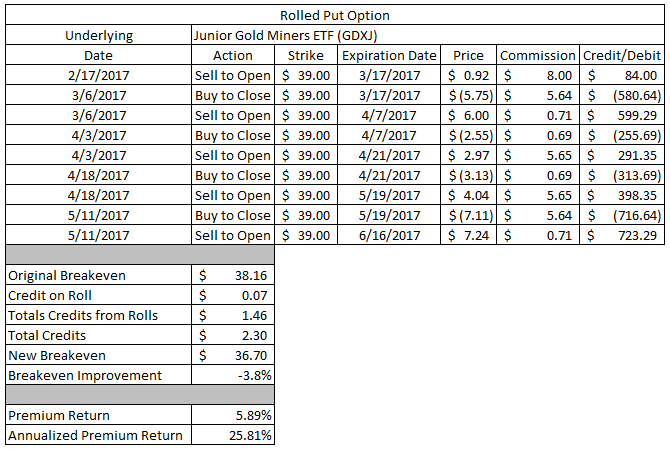 The additional option premium received from rolling has improved my breakeven point from the original $33.22 to $32.65 or approximately 1.7%. 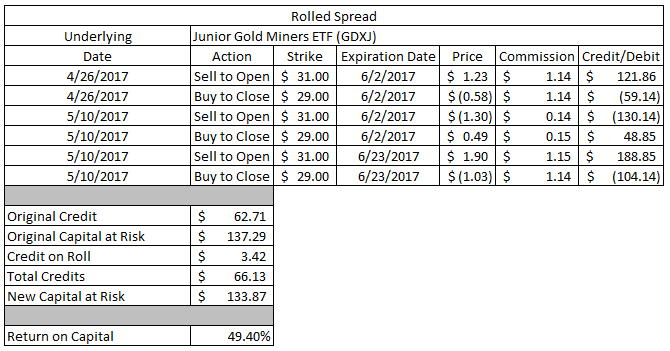 If GDXJ is trading above $34 at expiration then the contract will be OTM and I would be able to keep the credits received as profit. The $1.35 in total credits would represent a solid 3.98% return on the $3,400 in capital securing the contract. Despite pushing the contract out in time by an additional month that would still be a solid 26.8% annualized return. Most of the option positions that I put on come off within a month; however, this one hasn't exactly behaved and I've had this position in my portfolio since mid-February. Yikes! 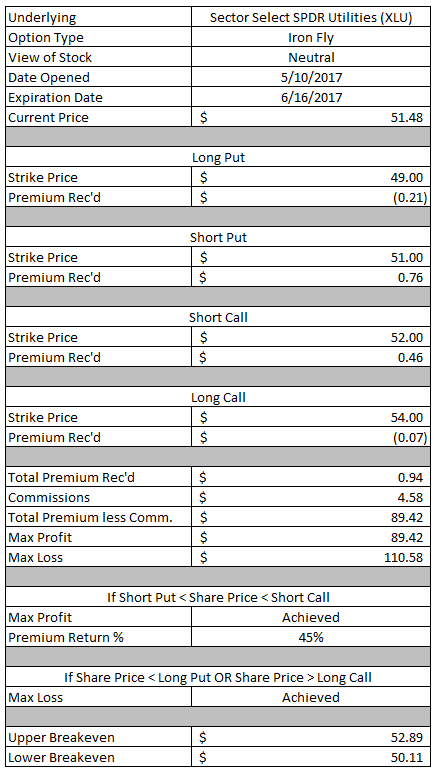 I was able to pick up an additional $0.08 in option premium by extending the duration of this trade another month. 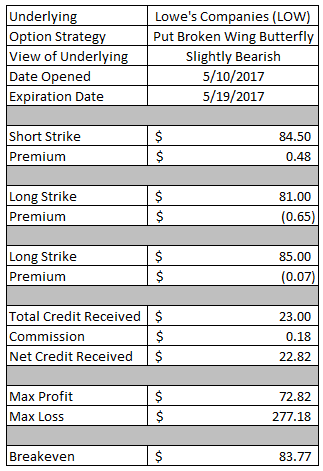 So far on the 3 rolls I've collected a total of $0.63 per share in option premium bringing the total credits on the position to $1.38. My breakeven price has been reduced from the original $23.75 down to $23.12 due to the additional credits from rolling the position out. If GDX is trading above $24.50 at expiration then the contract will be OTM and I will be able to keep all of the credits as profits. The $1.38 in total credits would be a solid 5.63% return on the $2,450 in capital securing the contract. Over the entire life of the trade that would equate to a 17.2% annualized return. 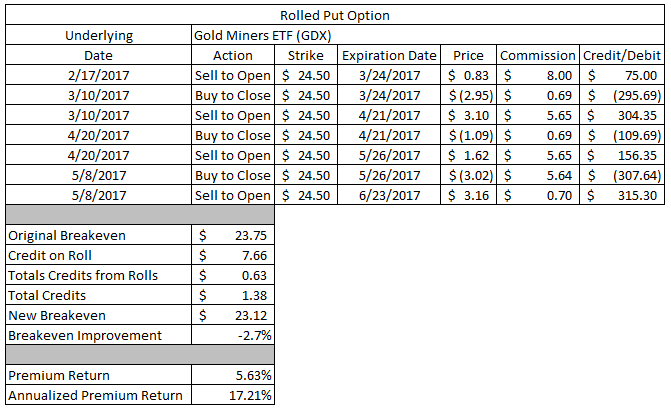 Much like the previous GDX put option this put option has been with me since mid-February. In hindsight this was too aggressive of a trade at order entry where if I remember correctly I actually sold a slightly ITM put option betting on a continued bullish move in the junior gold miners. Yeah, that hasn't exactly worked out. However, the good thing is that I've been able to collect additional premium along the way and should be able to turn this into a winner over time with the likely future involving taking ownership of the shares in order to sell calls against them. 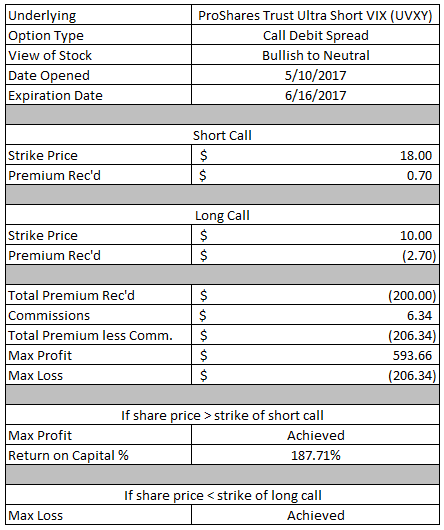 I was able to collect an additional $0.07 per share in option premium by rolling this position out to a later date. Across the 4 rolls I've collected an additional $1.46 in credits which brings my total credits received to $2.30 per share. My breakeven has been reduced from the original $38.16 to $36.70 just by extending the time to give myself a chance to be right. 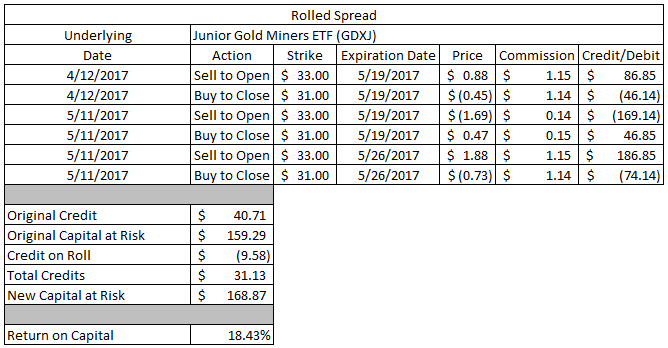 If GDXJ is trading above $39 at expiration then the contract would expire OTM and I would get to book all of the credits received as profit. The $2.30 in total credits would be a 5.89% return on the $3,900 in capital securing the contract. For the entire life of the trade that would still be a 25.8% annualized return. While it's fairly easy to roll naked/cash secured options out in time for a credit nearly indefinitely, rolling spreads is much trickier. The problem lies in the fact that you have a defined risk position and therefore at least 2 contracts to roll out. In order to do so for a credit you need the extrinsic value of the short option to be larger than the extrinsic value of the long option which usually means the underlying's share price needs to be between your two strikes. 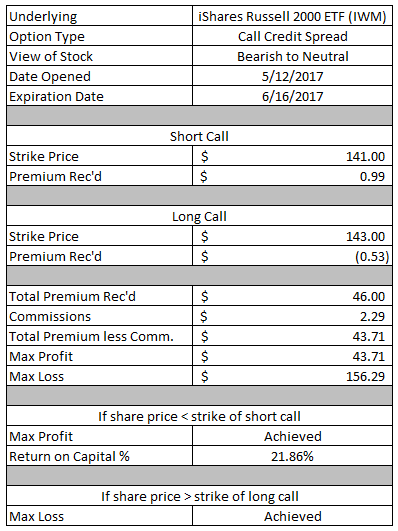 I was able to pick up an additional $3.42 by rolling this position out in time by 3 weeks. That brings the total credits received to $66.13 which reduces the capital at risk on this position to $133.87. If GDXJ is trading higher than $31 at expiration then both contracts would be out of the money and I would realize the max profit on this trade. The $66.13 profit would be a 49.4% return on the capital at risk. If GDXJ is trading below $29 at expiration then I will realize the max loss on this position. My timing with putting the original position on was about as bad as you could have hoped for. Within a day or two gold started pulling back and GDXJ declined significantly as well. However, the rebound this past week allowed me to roll the position out in time, although I was tempted to leave it be in hopes that I could close it out for a small winner. In hindsight though I wish I had just let it be. With defined risk trades I never want to roll the position for a debit; however, that's exactly what happened with this one...accidentally. I had set it up as a net credit, but then went to adjust the limit order lower by $0.01, unfortunately at that time the markets had moved and it was now trading for a net debit which I didn't happen to catch until after I routed the order and of course it was filled nearly instantaneously. Since I only extended the position by 1 week my goal for this upcoming week is to roll the position out in time yet again, this time for a credit. Unless of course I get the opportunity to just close it out at a profit. I paid a $9.58 debit in order to roll this position out 1 week. Ugh! That reduces my total credits received on this position from $40.71 to $31.13 and increases the max loss I can take on the position from $159.29 to $168.87. 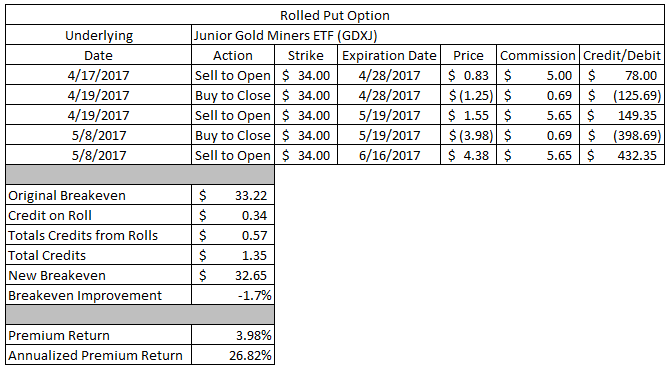 If GDXJ is trading above $33 at expiration then I will realize the max profit on this trade. The $31.13 profit would be a 18.4% return on the capital at risk. If GDXJ is trading below $31 at expiration then I will realize the max loss on this trade. Through the first trading week of May my net profits for the month sit at $789.31. Year to date I've realized net profits of $6,927.85. I'll be watching your UVXY play closely. 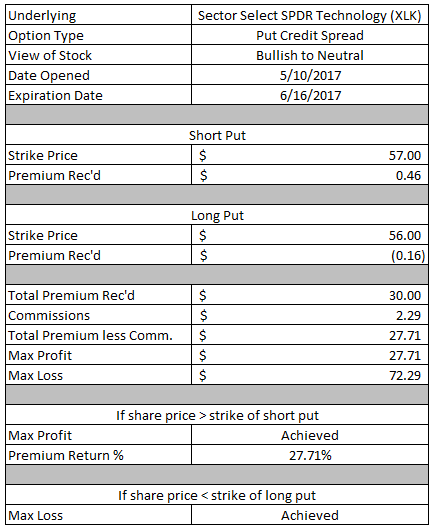 I keep a more or less permanent bearish options position open on the LEAPs for UVXY and have done very well over the years. I'm not a fan of being long volatility, especially in products that are meant to decay, but with it being this low I figured it was worth a shot. How do you play UVXY? Wait for it to spike then buy long dated puts? I think that's what you said you do but I can't remember for sure off the top of my head.